A total coast-to-coast eclipse of the sun hasn’t been seen in the U.S. in 99 years, so the Aug. 21 event will be a can’t-miss for many of us. UCSF ophthalmologist Julie Schallhorn, MD, MS, points out that just a few seconds of sun gazing can lead to solar retinopathy, which can cause permanent vision damage. Below Schallhorn explains how your eyes react to direct sunlight and how you can take the right precautions. Q: What is the main concern for your eyes when viewing an eclipse? When light enters your eye, it’s focused on a part of your retina called the fovea, where you get your best 20/20 vision from. The photoreceptors there are very densely packed, and there’s a little depression around that area where light is uninterrupted. The light hits the photoreceptors, changing the physical configuration of the molecules inside them. This causes the photoreceptors to send an electrical signal, which your brain interprets as vision. When you expose your photoreceptors to really intense light, those molecules have to turn over at an incredible pace because the light burns into them. And at some point, it becomes too much for the photoreceptors to handle, and some die – this is called solar retinopathy. You’re born with all the photoreceptors you’ll ever have – when photoreceptor cells die, they never come back and you’re left with a little hole in your vision. How much damage you actually do to your vision depends on how long you look at the sun and your anatomy. People can be anywhere from 20/40 to 20/200 – legally blind – depending on how much damage is done. Q: After you’ve suffered from solar retinopathy, can your vision come back a little over time? It depends on how much damage has been done. Even looking at the sun for a few seconds can cause damage. You always have an absolute hole in your vision where the photoreceptors are gone. However, your brain learns how to use the photoreceptors around the edge of that hole better. That’s when people see improvements in their vision. The photoreceptors aren’t regenerating themselves; it’s just that you’re learning how to use what’s left better. Q: What is the best way to protect your eyes while viewing the eclipse? Protective eclipse-viewing glasses are important to avoid eye damage, but there are lots of news reports about companies offering fake eclipse glasses that don’t actually have the protection that you need. There’s an excellent website through NASA that has a list of the glasses that do have the proper protection. 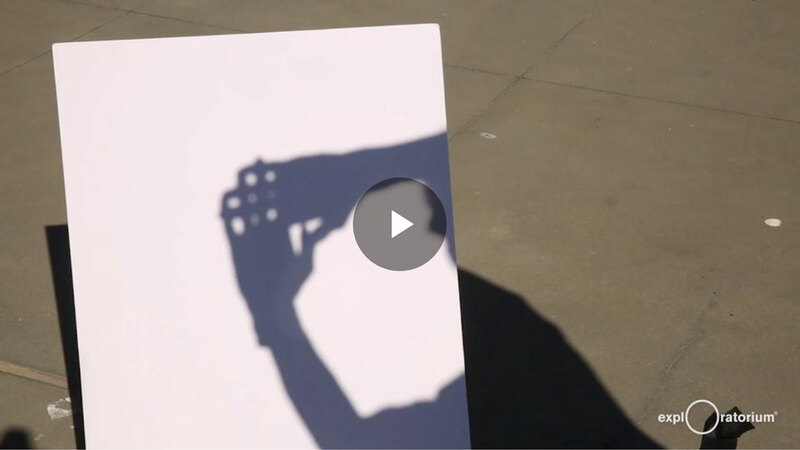 Watch a video by the Exploratorium on how to view the solar eclipse with the pinhole technique. If you’re outside during the eclipse and you don’t have your glasses, you can’t look at the sun directly. What you can do is make a small pinhole: Put your fingers together perpendicularly to each other to make a crosshatch pattern, then hold them up and look at the shadow underneath them. The pinhole only lets rays through that are directly perpendicular to it, and you can focus the light on a surface behind it. It will cast the shadow of the eclipse and look amazing. Q: Is it true that viewers who don’t do this pinhole technique and don’t have glasses are only safe during the totality? Yes. If you’re in the path of totality and you don’t have glasses, you should not watch until the totality happens. Then look away as the moon starts to move away. Using a method that will keep your eyes safe and enjoying how cool this natural phenomenon is, is really important.